I’ve booked an AirAsia flight via iPhone apps and done the mobile check-in in order to save the RM 10 over counter check-in fees. 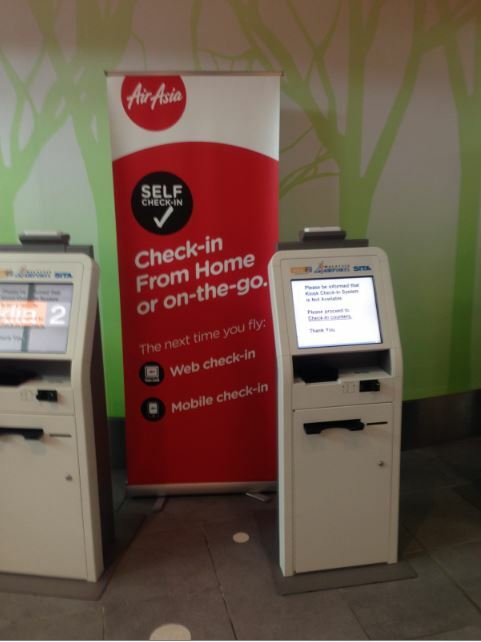 After that I was given an instruction to print out the boarding pass via self service kiosk via the AirAsia iPhone apps. Once I arrived KLIA2, I went to the self service kiosk to print the boarding pass, but all the kiosk near the entrance was out of electricity. Then I went to the self service kiosk near the check-in counter as shown in the picture below. Please be informed that Kiosk Check-in System is Not Available. Please proceed to Check-in counters.